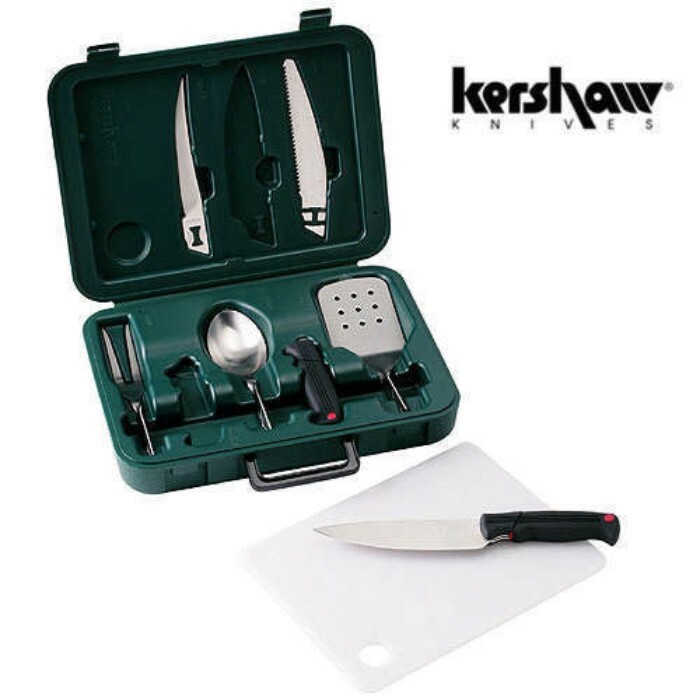 Kershaw Camp Tool Trader Set | BUDK.com - Knives & Swords At The Lowest Prices! The "Camp Tool Trader" features six tools for outdoor and indoor cooking. Angled spatula, fork, spoon, two handles and a convenient storage system that includes a large hanging hook. The two handles are ergonomically designed to reduce hand fatigue and are non-slip (made from black task force rubber with red trim). Cook's Blade - 6"; Fish Fillet Blade - 6"; Saw Blade - 6"; Spatula - 3 5/8"; Spoon - 3"; Fork- 3", Closed - 3 3/8"